* * * This is a city of parks and museums. The Park-e Millet in north Tehran is a lovely expanse of green, covered with trees, with the snow-capped Elborz mountains seeming to be just touching distance away. There’s even a cinema hall in the park, where you could catch the latest Iranian film, or just hang out in the cinema’s really impressive bookshop — impressive, that is, if you want to buy Woody Allen scripts in Farsi. But there’s also a great selection of traditional and experimental Iranian music and movie soundtracks. Further down Valiasr Avenue (North Tehran’s main drag and a really pleasant walk, what with the chinar trees and cascading water), there is the Museum of Iranian Cinema, which is a really wonderful place, set inside an extravagant mansion. The museum shop also sells boxed sets of Iranian movies and the works of major directors. Or you could go to the Jewellery Musuem in central Tehran, in the basement of the Bank-e Melli headquarters, and gaze at the ridiculous amount of jewellery collected by Iranian rulers, including the Darya-i Noor taken from the Mughals by Nadir Shah, and a globe made from rubies and emeralds. The National Musuem in Tehran is also really impressive and has beautiful artefacts ranging from the pre-historic to the Sassanian. * * * One can spend an entire day, or days, just hanging around in the Naqsh-e Jahan (Image of the World) square in the centre of the city. It’s a huge, massive public square and all of Isfahan’s grandest buildings are gathered around it—the Masjid Imam, Masjid Lotfollah, Ali Qapu palace, and the incredible frescoes of the Qayseriyeh Gate, leading to the arcaded Bazar-i Bozorg. 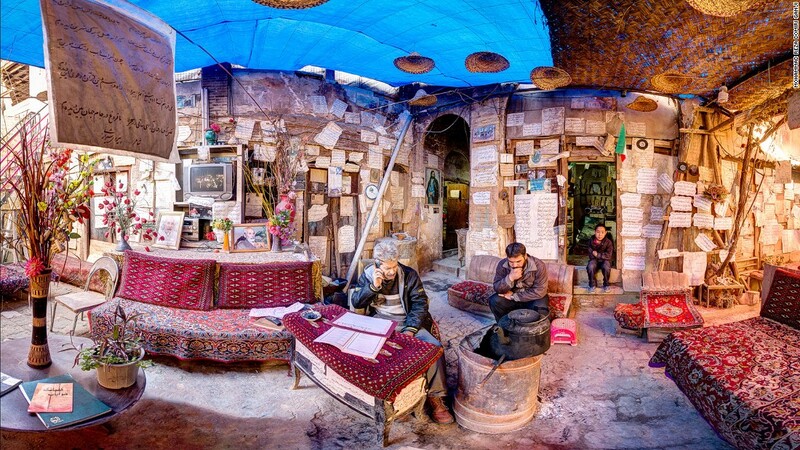 The shops around the square are also a great place — perhaps the best in Iran — to buy handicrafts, including carpets, tiles, and painted metal and lacquerware. Many of them are owned by artisans and you can see them at work. Isfahan is also famous for its nougat and pistachio gaz, and you can buy that here as well. After a hard day of sightseeing and shopping around the square, drop in at the Qayseriyeh tea shop in the evening for a view over the square as the sun sets and Isfahanis come out in droves to stroll and picnic. And then there’s the bridges over the Zayandeh. The Pul-e Khaju is unmissable, but the Si-o-Seh Pul, further to the west, is no pushover either. There’s a teahouse on the north end of the bridge here and, by walking over the Si-o-Seh bridge from Isfahan, you enter Jolfa, the old Armenian quarter. Here, you can visit the Vank Cathedral (Kalisa-e Vank), the centre of the Armenian church in Isfahan, built in the early 17th century, its interior covered with incredibly detailed and florid paintings. It’s interesting to see the mix of Persian and Armenian, Muslim and Christian sensibilities in the design and decoration of the Church. The museum here also has disturbing reminders of the Armenian Genocide. * * * There is exquisite architecture (the Jama Masjid, Amir Chakmaq complex), incredible performances (at the Zur-Khane, off Amir Chakmaq square), wonderful museums (Water Museum, also off Amir Chakmaq square) and Zoroastrian fire-temples and towers of silence. You can walk around the winding streets and covered bazaars of the old-city for hours. It’s surprisingly quiet and, walking through the streets, the play of light and shadow, shapes and texture and bizarre contrasts piled together is quite magical. The Silk Road Hotel also organises a quite amazing daylong Desert Tour which takes you to 17th century sarais, ice-houses and pigeon towers (Meybod), a Zoroastrian sacred spot (Chak-Chak) and the tumble-down ruins of a picturesque abandoned village (Kharanaq). Do it. * * * This serves as a good base for exploring the ruins of Persepolis and the tombs and sculptural reliefs at Naqsh-e Rustam. A half-day taxi from Shiraz will take you to both. But there’s much to see in Shiraz as well. The most obvious attraction being Hafez’s tomb, the Aramgah-e Hafez and the Nasir-ol-molk Mosque. The citadel at the centre of the city, the Arg-e Karim Khan; the ornate main market Bazar-e Vakil; and the Shah-e Chiragh shrine all merit a visit.